An abstract base class that should never be used directly, only inherited. 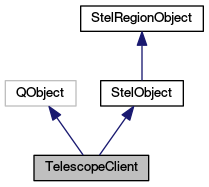 This class used to be called Telescope, but it has been renamed to TelescopeClient in order to resolve a compiler/linker conflict with the identically named Telescope class in Stellarium's main code. Definition at line 53 of file TelescopeClient.hpp. Definition at line 77 of file TelescopeClient.hpp. Definition at line 61 of file TelescopeClient.hpp. Definition at line 63 of file TelescopeClient.hpp. a QString containing an HMTL encoded description of the Telescope. Definition at line 62 of file TelescopeClient.hpp. Definition at line 76 of file TelescopeClient.hpp.